With this app you can watch racing live from 34 of the UK’s top racecourses. Racing UK has even partnered with bookmaker William Hill to make it incredibly easy to bet on any of the UK races you are following. Reviewing the Racing UK app, it’s clear there’s a lot going for it. Whether you’re on an Android device or an iPhone, there are lots of great basic features that you’d expect from any of the best racing apps. For example, you can easily find the latest information on prices, trainer, jockey, owners, weights, silks, horse form, trainer form and jockey form. You can easily make bets with William Hill and there of tonnes of great live content to browse through. Whist betting is an option it’s not considered as a betting app – We prefer to use the stats as a guide and then go away and find the best price for the horse on oddschecker or check what price we can get on the Exchanges. With the Racing UK app, you can watch every race from 34 of the UK’s top racecourses, from Aintree to York. All you need is to place a qualifying bet with William Hill through the Bet and Watch service. Alternatively, you can upgrade to a subscription to the live service via RacingUK.com for abour £10 a month and enjoy the same service without needing to bet. Given you get live races from the whole of the UK and Ireland it’s hard to beat. The app itself is free normally but you can subscribe to get the premium service – it’s up to you. In terms of all the other footage, it can be useful and it can be entertaining. We liked the Racing UK race previews and features to help inform, while the archive stuff was really good fun and a bit of a bonus compared to most apps. You can watch replays of famous races from the past, recently run Classics and some bloopers. Of course you don’t always want to stream live video so the Racing UK app makes sure there is easy access to all the latest horse racing news and results from all over the world. 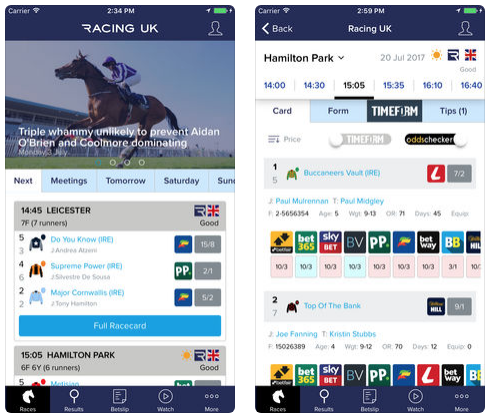 The Racing UK app is also a great place to gain an advantage on the market and find out which horse is worth a punt and which has three legs. There are daily tips and blogs from racing experts Tanya Stevenson, Angus McNae and guest appearances from some of horse racing’s top names such as Ruby Walsh, Harry Bentley, Kirsty Milczarek and Aidan Coleman. While we’re on betting tipsters, it’s worth noting that there is a whole more to the app than just the opinions of a few experts. We particularly liked the Verdicts section of the card, which lets you see how each horse should perform. This can really help with your betting app but it’s worth checking the horses yourself rather than just wildly backing it on the say so of one tipster. You’ll often find that in the same race 2 or 3 different tipsters will be betting on different horses as its all about opinions and what they’ve seen from the horse in previous races. On tipster may favour betting on a horse when its run at the same course previously, where others like Andy Holding have their own speed rating systems that they use. The iCard Predictor, which you can launch as a standalone tab from the app, gives a prediction of how each horse ‘should’ perform in the race you are looking at. This gets pretty technical but essentially it’s all about pulling out as many different bits of data as possible to come up with a bias – more than 60 different parameters are included. This involves everything from current form, past form and course form, to the weight, jockey, trainer and going. The great thing is you can edit these to suit your own requirements and betting approach. We really like the colourful and vivid racecourse information graphics that comes with the app. As soon as you sign up you can view full course information and graphics, contact information, how to get there and so on. All in all, it’s hard not to like the array of features you get from the app and it’s really quite easy to navigate and use. As an all-round racing app for the iPhone or Android device, it’s right up there. If you would like anymore information on the Racing UK app feel free to connect with us on social media, Facebook, Twitter or Google+.